Nissan 300ZX Turbo & Non-Turbo. Premium Timing Belt Kit for 300ZX. Complete timing kit includes only genuine and Japanese OEM quality parts. This kit exceeds Nissan timing belt service requirements. Genuine timing belt, NPW water pump, all pulleys, tensioner roller, seals and gaskets. Even includes thermostat and serpentine drive belts. All good stuff, not thrown together using the cheapest components. Complete Kit Includes The Following New Parts. Idler Roller / Pulley #1. Idler Roller / Pulley #2. NPW Japan / With Studs. Nippon Japan / 4 pieces / Front. Genuine Nissan / 2 pieces / Front. Gates or MotoRad / 77c OE Temp. All parts brand new in package. Picture shows actual parts for reference. 3.0L / V6 / VG30DE. Thank you for your service! If the problem was our fault... Wrong part, missing part, damaged... For any questions regarding this item... We answer all messages within 24 hours. Really Good Parts, Prices And Service! 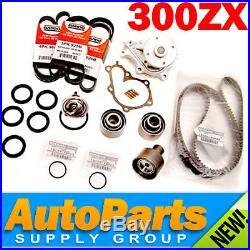 The item "300ZX NON-TURBO Complete Timing Belt+Water Pump Kit Genuine & OEM Parts 1990-93" is in sale since Thursday, October 20, 2011.